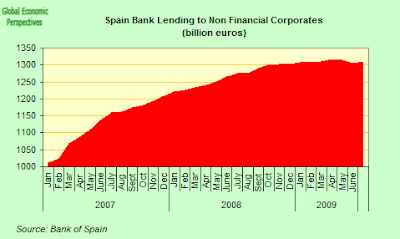 Global Economy Matters: How Will The ECB Ever Manage To Stop Funding Spanish Government Debt? 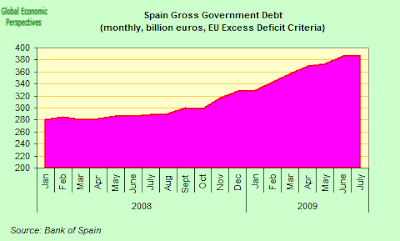 How Will The ECB Ever Manage To Stop Funding Spanish Government Debt? 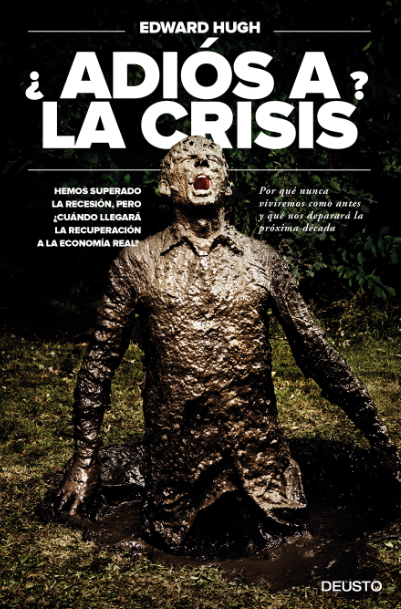 The looming problem of what will happen as and when some of the other Eurozone economies eventually start to recover while the Spanish one languishes in decline is finally starting to make the columns of the global financial press. Yesterday Thomas Catan had an article in the Wall Street Journal entitled Spain's Struggles Illustrate Pitfalls of Europe's Common Currency while Emma Ross-Thomas and Gabi Thesing also had a similar sort of piece in Bloomberg, under the heading Europe’s Two-Speed Economy Complicates ECB Rate Plans. So the difficulty Spain could represent for the rest of the Eurozone is now it seems becoming the "Topic du Jour". Even as France and Germany begin to show signs of economic recovery, weaker members of the European common-currency union remain mired in recession. Without painful overhauls, euro-zone countries such as Spain, Italy, Greece and Portugal seem set for years of meager growth, making their debts harder to pay. That raises the question: Could the divergent economic fortunes of euro-zone countries pose a problem for the currency union itself? Europe’s economies are rebounding at different speeds, complicating the European Central Bank’s efforts to put the region back on a more stable footing. Even as the global economy recovers and Germany and France return to growth, the European Commission yesterday cut its forecasts for Spain and Italy. Deutsche Bank AG says some of the economies that were once motors of growth and job creation across the 16-nation bloc may stay mired in recession next year. So what is the background here? Let's look at what has happened in Spain. 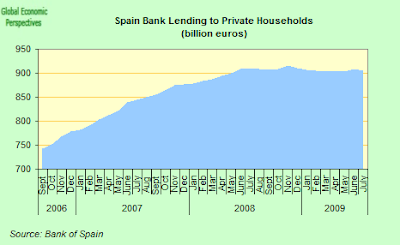 The Spanish property bubble started to slowly puncture throughout 2006 (well before the outbreak of the Sub Prime crisis) as the ECB steadily started to tight monetary policy and raised interest rates - the biggest weakness, and greatest vulnerability in the Spanish domestic economy is the way Spanish mortgages are overwhelmingly (85% plus) of the variable interest rate variety. 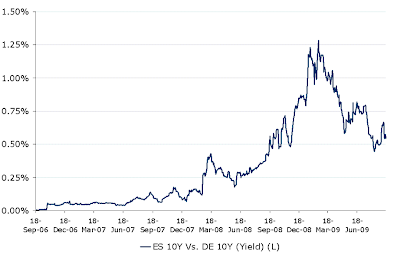 That makes Spanish consumption exceptionally dependent on ECB interest rates. Thus, when these are lowered, as has happened over the last nine months, the relief is virtually instantaneous (as can be seen in the recent surge in the consumer confidence index) but when they are raised the squeeze on spending power is acute. Spain's construction industry was the first to notice the change, and activity slowed as the prospect of higher interest rates loomed. In fact by the time we reached last July the construction industry had already been contracting for three years, and from the July 2006 peak activity was down by 30.5% - that is it is the industry had shrunk to 70% of what it used to be. The decline in construction was followed by a decline in industrial output and job creation, which both peaked in June/July 2007 - with production having fallen by 33.45% from the peak by last July. That is industrial output has now been falling for over two years. 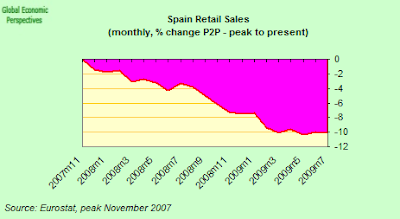 Then, as the economy slowed domestic demand started to fall, and retail sales are now down a little over 10% from their November 2007 peak. So, as we can see, the whole economy is steadily sliding down, as first the builders, then households, and then finally companies steadily reduce their spending, and the drift is relentless. And so things continue, and we hit the next stage, and in comes the government to support the economy, which is now extraordinarily indebted and at the same time extremely demand deficient. It is demand deficient because all the main groups of domestic economic agents are steadily trying to cut back on spending and debt, and the export oriented sector, after years of neglect and internal price inflation is now just not competitive enough to make up for the gap. So there is simply a huge sucking sound and the economy folds in on itself, and it is just this implosion force that the rise in government activity attempts to cushion. So far, so good. This is the stuff burt bubbles are made of. But this respite offered by the rise in government indebtedness is only viable and worthwhile (after all, you are only creating even more debt, which at some point needs to be paid) if it serves to facilitate the kind of economic correction Spain most urgently needs, which involves inevitably and inexorably transforming itself into an export driven economy. But what happens as the government starts to take on all the debt, well, as we saw last year, the interest differential, or "spread", that the Spanish government has to pay on its debt suddenly starts to surge, as investors begin to worry about the sustainability of all the new debt. So what happens next? Well, as Claus Vistesen points out in his recent analysis, the ECB needs to step in with a massive one year liquidity injection, and this effectively enables the Spanish banks to borrow the money they need to buy the bonds directly from the government, and then deposit the bonds purchased over at the ECB (with a haircut - or discount) to serve as collateral for their borrowing, earning on the way a minimal interest differential, or "carry" for their labours. Thus the ECB does indeed indirectly slightly improve the liquidity position of Spain's banks, even if the big news here is really that the ECB is - wittingly or unwittingly - indirectly funding Spain's fiscal deficit. Let's take a look at the spreads for a moment. The first chart shows a comparison of the "usual suspects" club - Spain, Ireland, Greece, Italy, Portugal and Austria. As can be seen, these spreads widened notably last winter, on the back of the Lehman collapse inspired financial crisis. They have subsequently narrowed again although notably we are still not were we were before conditions deteriorated, and especially the Greek and Irish spreads remain worryingly high. Of course, part of the explanation for the improvement is the return of risk appetite, but there is also another factor, an institutional one, which I hope in the course of the coming paragraphs I will be able to demonstrate, since it is my contention that, in at least the Spanish case, the tightening of the spreads has been (an intended or unintended) direct consequence of ECB liquidity provision. And if the spread has only come down (see the chart below for the Spanish case on its own), then the reasonable question to start thinking about is what might happen to the spread once this support is withdrawn. 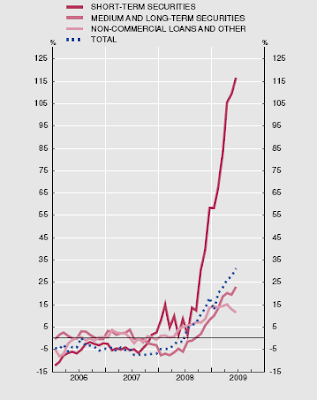 As we can see in the accompanying chart below, the issuance of short term debt (the maroon line, the one which spikes dramatically) has grown at very high year on year rates this year, yet despite all the talk of governments ahving difficulty placing debt, the spread on Spanish debt has softened. Now why might that be? Well, quite conveniently for our present needs, the ECB, in its June Monthly Bulletin, supplied some useful details about the level of government debt purchases made by the various financial institutions. Basically what can be seen from the data is the way in which Monetary and Financial Institutions (MFIs) have been steadily moving away from riskier assets into the relatively safer area of government debt as the force of the financial crisis blast hit them head on. The ECB estimates that the Eurozone banks really started seriously acquiring government debt in the first quarter of 2008, building up their stocks at an average rate of about €30bn a quarter. But then, in the first quarter of 2009, there was a sudden surge to a rate of around €90b. During the last part of 2008 and early 2009 many of these purchases were in fact made by what are called money market funds which, as Barclays Capital analyst Laurent Fransolet points out in a June research note (to which I am indebted for this part of my analysis), is not entirely surprising since at the end of last year a lot of the buying originated from French, Luxembourg and Irish MFIs, the three countries which are host to biggest slice of the money market fund industry in Europe. Since the beginning of 2009, however, things have changed, and it is clear that the banks have actually been responsible for most of the buying. 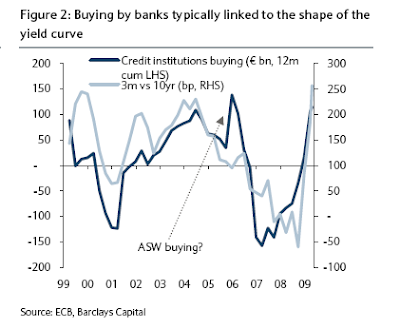 Based on the ECB estimates, it seems that something like 75% of the Q1 buying was conducted by banks. The ECB explanation is that a lot of this buying is more or less normal at this stage in the credit and business cycle, when risk sentiment is low. In fact Fransolet points out, and illustrates with a chart (below), how historically there has been a reasonably good relationship between the steepness of the yield curve and the buying of government debt by banks (and indeed MFIs in general). Basically all of this is a reflection of the sort of "carry" positions banks find it convenient to take on board when yield curves are steep, since they can normally fund themselves at a pretty low rate, it is then quite interesting for them to buy near 0% risk-weighted assets that are yielding a few percentages points over their funding costs, and in this way they both make money and rebuild their capital base and de-risk their balance sheets at one and the same time. As Fransolet notes the ECB does not offer a direct breakdown of such purchases by country. However the ECB database does contain a breakdown by country at the MFI level. What we find here is that the purchasing of government debts by MFIs has been far from uniform across countries. In fact the largest purchaser has been, guess who, the Spanish financial system who have bought about €9bn a month over the past six months - strange how that number just nicely covers what is needed for the current account deficit, isn't it . As Fransolet concludes: "Obviously, this bank buying is not the only reason why cross-market spreads have retightened recently, but it has definitely been a big factor." 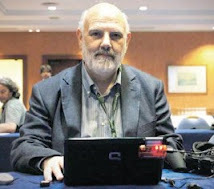 To this I would add another piece of circumstantial evidence, one that hasn't been widely reported in the press, and that is that Spain's share of the 442 billion euro June 24 one year tender represented something over 15% of the total, when the share of the Bank of Spain in the Eurosystem is just over 8%. 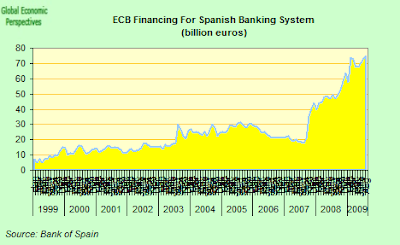 Not only that, as can be seen in the chart below, the level funding injection into the Spanish banking system (net of Spanish bank reserve deposits with the ECB) has continued to shoot up all year. while lending to government has, of course, and as we have been noting, been shooting up. So while it is surely true that we can't say simply say outright and categorically that the ECB is carrying out indirect intentional debt monetisation and thus engaging in Quantitative Easing stricto sensu, we can say, and without a shadow of a doubt, the ECB one year liquidity injection has, in the Spanish case, largely served to help monetise Spanish government debt. And this is where the problems and all the exit related issues start. "The ECB is not actively pursuing a policy of funding the growing pile of government debt in Austria, Ireland and Southern Europe, but it is in fact doing so as an indirect consequence of its actions. Thus, given that I think we can all assume that any eventual recovery will be uneven, unwinding liquidity provision in the aforementioned countries is going to involve very special problems, since evidently, if these governments seek to substitute free market funding for the current institutional one the spreads will evidently balloon again. And here is the dilemma, for those who can recover will, while the rest may be simply sent straight to hell." 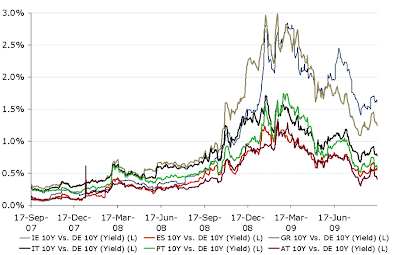 ii) this process can later lead to difficulties in the banking sector if there are differing maturities on the debt in question, that is, if the banks borrow short to lend to governments who needs are over the much longer term, this leads to a problem when the central bank withdraws funding if ready support is not available for the government debt in the private market. This would be the position in Spain if the ECB go for exit in July, and the Spanish government needs to rollover its 2009 debt at the same time as funding its 2010 deficit. iii) the central bank also runs the risk of financing excessive deficits, if it has no political control over the actions of the government in question (which in the ECB case it manifestly doesn't) then funding supplied for one purpose can easily be used for another, and this is exactly what is happening now in Spain, as funding made available to ease Spain through a much needed correction is quite simply being wasted. This situation can create "grave dilemmas" for the central bank. This is where the ECB is at now with Spain. v) and the worst of all this is that not having carried out the correction, the most serious problems will face Spain should the rest of Europe begin to recover before Spain does. And this takes this whole post back to just where it started. The reason for (v) should be obvious, since if we think about the fact that most Spanish mortages are variable, then the ECB will not only be withdrawing the credit enhancement liquidity support from the banks, it will also be raising rates, indirectly tightening the noose even more strongly around the neck of the unfortunate Spanish, most of whom actually have no idea at all of what is to come next. So in closing I will go back to Thomas Catan in the Wall Street Journal. As he sees it, when faced with a debt crisis the ECB and the EU Commission have essentially three ways out, and it is now up to history (and hopefully a few strokes of good fortune) to decide which of the alternatives he outlines will actually carry the day. 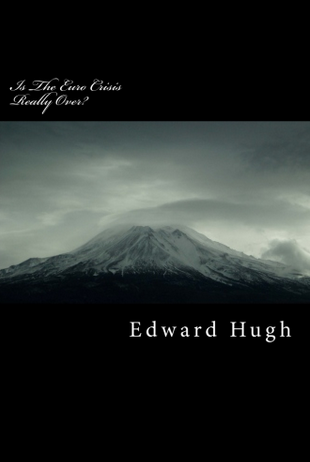 In the case of a debt crisis, there would be three main ways out -- all of them painful. Faced with a debt crisis in weaker members, the euro zone could eliminate the problem by moving to full political union. Government bonds would be issued centrally, with the funds doled out to member nations. But that seems like an awfully hard sell at a time when there is scant enthusiasm for further integration in many European countries. The second is the so-called nuclear option. Tired of paltry growth and spiraling debts, a country such as Spain or Italy could decide to scrap the euro. That would almost certainly mean defaulting on its national debt, which is denominated in euros. Investors would pile pressure on the next weak link, possibly leading to a chain reaction and a collapse of the currency. Given how damaging the nuclear option would be to everyone involved, one has to imagine that Europe would opt for the third option -- bailout -- no matter how unpalatable. Such a bailout would be hugely controversial. Germany and France would find it hard to justify it to their own taxpayers. And they would most likely have to impose unpopular, International Monetary Fund-style austerity plans on the other countries, stoking tensions within the EU. The euro zone still has time to kick-start growth by taking concerted action. Unfortunately, it may need the threat of a debt crisis to begin doing so.